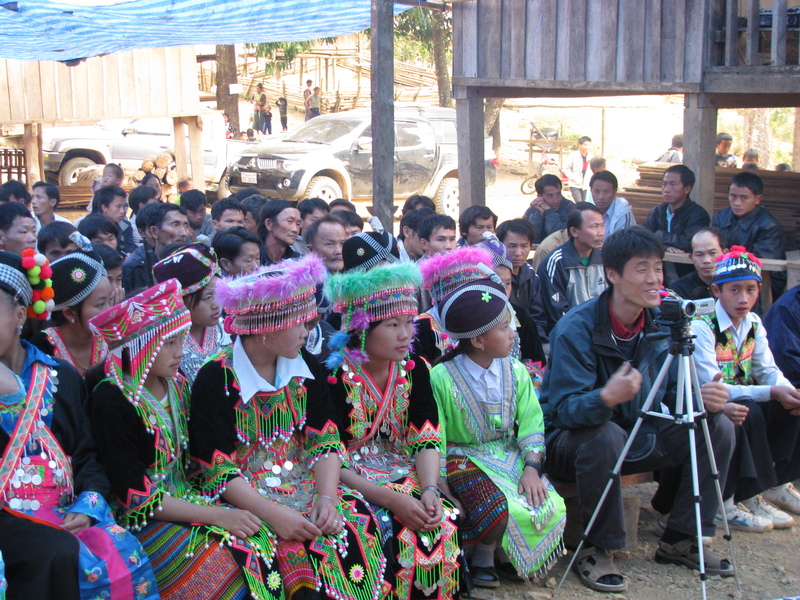 Seungho Han (Korea), a former UNV Environment Specialist with UNDP in Lao PDR, recalls his last field vist to a remote village where the community joyously launched a small hydro power system they had built themselves. Houay Ngou, Lao PDR: My last field visit was for a small hydro power project in the remote village of Houay Ngou in northern Lao PDR. The villagers had invited our GEF (Global Environment Facility) SGP (Small Grants Programme) team to the opening ceremony to celebrate the launch of the new small hydro power generating system. It takes almost two days to reach the village from Vientiane, the capital city, due to its remote mountainous location and dusty road conditions, but we were happy to attend. Houay Ngou village is situated in the deep valley of Paklai district, Sayaboury Province. The villagers are from the Hmong ethnic community which has a sad history of civil war since the Vietnamese War. There are only 39 families including 137 women. Most are engaged in rice cultivation, animal husbandry, and the collection of non-timber forest products (NTFPs). Furthermore, the community has been marginalized for a long time from public services and financial and policy support. To improve their livelihoods the construction of a small hydro power system had been proposed and initiated by the villagers themselves one year ago with the support of the GEF-SGP. The ceremony to launch the new hydro power plant was held on a lovely Sunday morning. The small valley at the foot of the mountain was full of people, including visitors from neighboring villages and provinces who gathered excitedly to congratulate local residents on completing the community project. Mr. Bouaphan Makhphonh, Governor of Paklay District, Sayaboury Province, spoke on the provinces behalf, commending the community members for their efforts in completing the project with their own hands. The villagers had voluntarily participated in constructing the system. Traditionally, they had been tapping trees in the forest for resin or, when it is not available, buying expensive oil from the distant market to light their candles at night. Now, thanks to the electricity from the small hydro power system, they no longer need to do this. Village residents can also use easily accessible clean water from bamboo pipes connected to the water turbine. This is reducing the work load of the women who used to carry water back from the paddy field after a hard days work. Villagers have been particularly united in their efforts to protect the watershed forest at the top of Houay Ngou stream. This helps to secure the water resource for the hydro power all year round. The opening ceremonies culminated in a traditional dance known as the Khaen, performed by Hmong villagers to the accompaniment of bamboo pan flutes. Before I started volunteering with UNV, my attitude towards local communities was simplistic. These communities have been isolated and marginalized and thus needed more help from the government and international donors. Their participation was important only for the reason that without their involvement, we wouldn't know how to help them. But, I must admit that towards the end of my assignment my view had totally changed. While meeting with local communities in stakeholder workshops and field visits, I gradually became aware of their wealth of potential in achieving sustainable natural resource management. I have found that most local communities are equipped with invaluable ecological knowledge which has been passed on from their ancestors and acquired by their own experiences in managing natural resources.They have knowledge about the medicinal properties of local plant and tree species which are not yet described scientifically. They know about traditional growing practices to manage agricultural lands and the forest without causing undue harm. They know of the sufficient fallow periods to rehabilitate the forest and the inter-cropping to maintain the soil quality. This indigenous knowledge must be used when applying scientific knowledge and practices into the local environment. Their commitment to environmental protection will also be stronger if they can be provided with opportunities to be involved because the local environment is of direct economic and great cultural value to them. Having said that, one of my precious lessons learned during the past year is that it is a top priority to identify, direct, and maximize such community potential towards sustainable natural resource management at the earliest stage of each project. Because of the significant climate change in Lao, for example, we are seeing an increase in floods and more frequent and severe drought spells. Many villages in the remote areas will be vulnerable to these unexpected changes caused by the impact of industrialization in other areas of the globe. Seungho Han (Korea) served as a UNV Environment Specialist with UNDP in Lao PDR from April, 2010 to April, 2011.